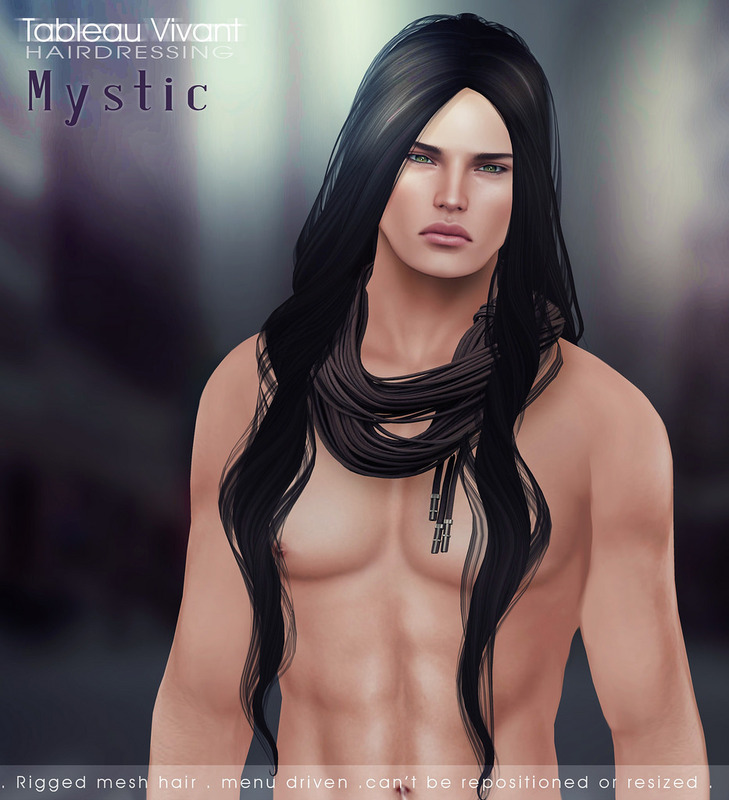 The Fantasy Collective started a new round and we have a magical hair style available for you. The lovely Lucrezia is a partially fixed mesh style that comes with a detachable ponytail and color change accessories. This style is whimsical with it’s braids, beads and option to wear it as an updo or with the ponytail. We find it will be perfect for any style; not just for the lovely role playing dresses. 2 Ponytail Versions – Long Neck and Regular Neck. 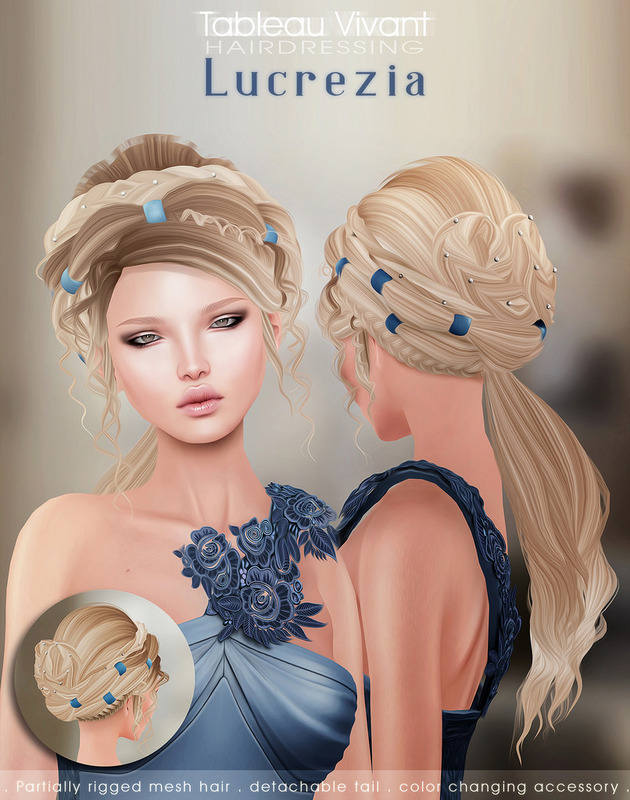 You can find Lucrezia at the LM below. We hope you enjoy our new beauty as much as we loved bringing her to you. Two very fun events opened yesterday and we are excited to be a part of them both..
First one is The Seasons Story and we are helping to celebrate their 1st Anniversary with the very lovely Koyo. Koyo in Japanese means Autumn – colored foliage so we thought it was a fitting name for the long style with just the perfect amount of the windblown look for those chilly autumn days. Now for the Mystic Realms Fair. For this event we did several styles, including some similar ones for the women and gents. Myst and Mystic are long, parted in the middle with delicate waves flowing past the shoulders with the tips nearly touching your waist. This style is very versatile for whatever you choose to wear it for. Fortuna and Prophet are also long styles with a thick portion of hair covering their eyes. They see no evil, but that doesn’t mean they can’t be a little wicked. 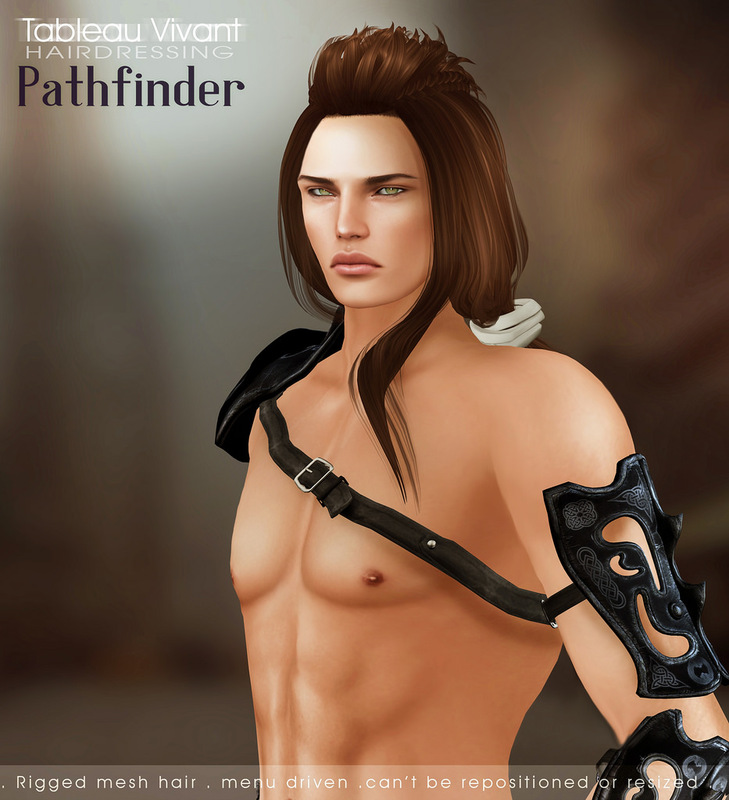 Pathfinder is a unique style for both male and females. The top is shorter than the rest, in almost a faux mohawk with braids on either side, long sides that sweep back into a ponytail with one large tendril escaping. It seems to be begging for some serious trouble, don’t you think? Last but most certainty not least; Defiler. This style is unisex, comes with two hair bases and if Pathfinder was begging for trouble, Defiler is the one to give it while demanding respect. All hair released for both events has our new hud systems which means; 1 hud with 30 tint options. The fatpacks contain 12 huds (11 listed plus an exclusive one, Chemistry, not available as a single pack). For undelivered purchases, please visit our redelivery terminal in the Main Store. We hope you enjoy our releases as much as we have loved bringing them to you. The 8th of the month means a whole new round of Collabor88! Tableau Vivant is always excited to be a part of this event and bring you new things. This round we have a few new styles for you. The gorgeous and romantic Hallie is long with brow length bangs and a slight curl at the ends. Pretty Winnie is also long and flowing but with bangs to the side, to give you a bit more of a mature look. Winnie means business! Mimi is a cute, little cat ear/horn add on for either of the hairs or any hair you have from Tableau Vivant. Mimi is unrigged mesh so that you can do anything you want with them, kawaii or spooky – cute…up to you! Left and right parts are separate so that you can fit them better and please note that by default they are attached to your ears so add them if those spots are taken. 1 HUD With 30 Tint Options. For undelivered purchases please visit our redelivery terminal in Main Store. Pick up all three styles at Collabor88. 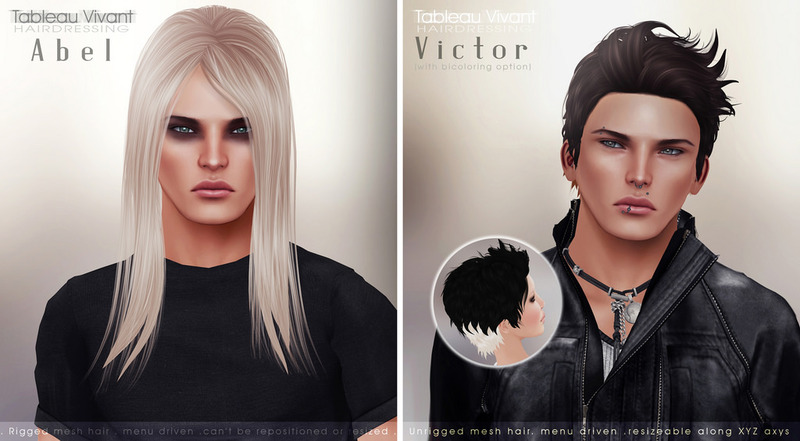 We have very exciting news over at Tableau Vivant! A new build, several new hair styles, new pricing andddd the biggest news …. several of you ladies and gents sent us requests during the past few months requesting different colors for hair. We listened and have spent the past few months working on the new color line and updated our huds. Oh and a group gift! This notecard is going to have tons of information so get comfy and start reading. New prices for single packs: 250l$ for hair without extra accessories or extra parts and so on, that will remain at the old price, 300l$. Fatpacks, no change and there is an exclusive, extra hud inside. All new releases will feature the new colors, previous hair will not be updated. Each HUD feature 30 options. Under balayage label – basic colors. We have reproduced this kind of effect to avoid a dull coloring so, even wearing base colors, your hair will never look flat. Streaks, ombré and highlight are variations of the base tints of the hud with different effects. Basics hud is a selection of base tints of different huds, to meet male customers needs or those not in love with too many colors or effects. Tip for the guys: go for it. Chemistry hud is an experiment. We played a lot with colors and effects and it is considered an extra. It will be available only inside fat packs and will not be sold as single option. Now let me show you the hair! Victoria and Victor HUDs feature an extra tab: options. It will control only the back of the hair, for a trendy bi-color style. And as promised – a reopening group gift! You must join the group to pick up the gift and in joining the group if you wear the tag when you shop, you receive store credits with each purchase! We really hope you will be happy with the final result.